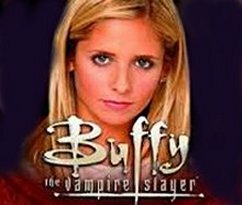 Buffy The Vampire Slayer stayed popular for all seven seasons and new fans are born daily. All ages flock to conventions where the cast of Buffy The Vampire Slayer (BTVS) sign pictures, greet fans, take pictures with fans and talk on panels. Fans are drawn to the series because of vampires, romance, adventure, and girl power. Side note: Ready to binge watch? The series can currently be viewed on demand at Amazon and Hulu. In season 1 from 1997, Buffy is introduced as a troubled teen who moves to a new town and new school for a fresh start. Later fans find out she burned down her former school fighting vampires but nobody knew the truth, not even her parents. The only person in the town of Sunnydale who knows Buffy is a Vampire Slayer is her watcher, Giles; who also happens to be the new school librarian. It isn’t all bleak for Buffy as she makes two new friends in Willow, Jesse and Xander. An introduction of what seems like a stalker turns out to be someone interested in helping Buffy slay the vampires. This stalker will pop up from time to time assisting Buffy and her friends. Fans are introduced to the local hangout called The Bronze. This is where many adventures are to happen for the group of friends. Season 1 also introduces the main evil master who has a goal of killing Buffy. Visions of future episodes are seen in dreams Buffy has for example; Joyce brings Buffy to school and tells her to try not and get kicked out as she leaves the car. Buffy grins and agrees, but later in the season she is kicked out of school. Music played an important part in BTVS. New groups were introduced and played at The Bronze. Over the years many groups started and gained popularity from appearing on the show like the group Nerf Herder. There were even CDs made from all the musicians who appeared each season. The Buffy Radio Sunnydale soundtrack is my favorite. Season 1 explores the start of a strong young girl finding her new role as a Vampire Slayer and saving the world not alone but with her friends. The scene is set for season 2 and fans eagerly awaited the start. Now 16 years later fans still seek Buffy merchandise, the stars, the music and the comics from the series. Buffy The Vampire Slayer = Win!